Despite the Cuban embargo being lifted in December 2014, the island nation is still ravaged by collectivist policies like gun control. Could the presence of privately-owned firearms held by citizens help pivot Cuba towards the path to freedom? It’s very plausible. Ever since the Castro regime violently and ruthlessly rose to power in 1959, the presence of firearms has been nonexistent. Since installing a military dictatorship, the Castro brothers have made private gun ownership impossible, subject to regulation, and punishable by law. Cubans have thus been rendered defenseless — a factor convincing many Cubans to flee the communist nation for freedom elsewhere. Cuba’s government has deliberately created an environment where a Second Amendment can’t thrive. It has complete pull over all industries in the country, including the firearms industry. It assigns responsibilities to loyalists in Committees for the Defense of the Revolution (CDR) — thuggish neighborhood watch programs slipping into obsolescence — to enforce laws to discourage dissent, instill fear in neighbors who fail to goose-step with the regime, and provide so-called security for those who pledge to a CDR. Moreover, the government exploits disarmament policies to instill fear in people. Despite the terror seen under the Castro regime, some Cubans have accepted the military dictatorship in place. If Cuba were to become capitalist like the United States, some suggest, changes in gun laws could be possible and therefore lead to violence. One example of this contorted view was demonstrated on the March 20 episode of the CNN program “The Wonder List with Bill Weir” on Cuba. Host Bill Weir asked musician and rapper Daya Suarez her thoughts on the possible influx of American tourism dollars pouring in. Ms. Suarez responded by saying increased wealth would lead some Cubans to buy firearms to protect private property, therefore leading to violence — violence, she says, the military dictatorship wiped out after they rose to power. This claim could not be more laughable. The presence of firearms in Cuba would not be a detriment to their quest for freedom. Rather, firearms will enable Cubans to declare their freedom and not be subjected to the whims of the Castro regime. The presence of more guns in the hands of good people will help stop guns in the hands of bad people. Much to the chagrin of the Castro regime and gun control advocates here in the United States, countries with high firearm ownership witness less overall crime than countries with low firearm ownership. Countries like the United States, Czech Republic and Switzerland encourage gun ownership in some form or fashion. (The Second Amendment arguably makes our gun laws the best in the world.) These three countries are demonstrably free, relatively safe and undoubtedly civilized. Why? Individuals in these countries believe in self-defense, self-preservation and true gun safety. Additionally, the presence of more guns has kept homicide rates down in all of these countries — a fact our opponents dismiss. Unlike the three aforementioned countries, Cuba has no regard for its people or quality of life. 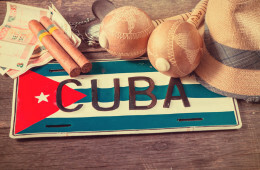 Like its influencer the former Soviet Union, which witnessed high murder rates thanks to its disarmament policies, Cuba will fall into further oblivion if disarmament, like other totalitarian policies, remains in place. One January 2015 Miami Herald article suggested Cuba is “virtually free from the violent crime that plagues much of the Americas.” That’s patently false. Cuba is a military dictatorship whose deadly grip is universally felt by the people it oppresses. For example, Cuban dissidents are still imprisoned and tortured if they dare challenge the Castro regime. Tourists like British teacher Laura Jones, 26, travel to Cuba under the impression it boasts the lowest crime in the Western Hemisphere but soon discover the opposite. Shortly after her arrival to Cuba, she was strangled to death in her hotel room — for no apparent reason. So much for Cuba being a safe place. The notion that a communist haven could be safer than the United States or any other Western nation is preposterous — especially if disarmament policies are in place. Cuban crime reports are inaccurate and its state-run media refuse to report on the human rights abuses committed under the Castro regime. Mr. Martinez is absolutely correct. Tyrannical societies are largely defined by disarmament. He lived it and knows his homeland suffered as a result of this and other oppressive policies. Cuba won’t be free if the Castro regime remains intact. If the troubled island nation wants to experience true progress, gun rights and other rights must be restored to its people. Havana: will Presidents Castro and Obama finally pull the US-Cuban book ban off the shelf?